An excellent value multi-function mug press kit which comes complete with six attachments which allow you to press our full range of mugs including the Wycombe, Sparta, Devon and latte, the espresso cup and our range of coffee cans, Thermos containers and glass bottles. The press features fully digital temperature control, an automatic digital timer, a solid steel welded framework. The heating elements have a soft liner and can be quickly and easily changed to accommodate a very wide range of shapes and sizes of mugs, glasses and other drinking containers. 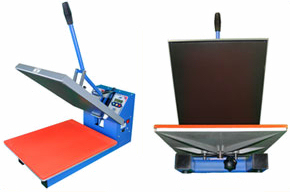 The Transfer Press is a distributor for Europa Leisure Equipment who, we believe, manufacture the most reliable and user friendly range of heat presses available in the UK. Europa heat presses are widely used in both the Premiership and lower leagues and in many high street sports chains. All Europa Leisure heat presses feature a computerised temperature and timer control module. They are CE approved and manufactured in the UK. All presses come with a lifetime heater element warranty and a standard one year inclusive warranty which can be upgraded. Delivery is normally available within a week, often much less.These machines are so simple to use you really can take them out of the box and be producing superb results within minutes with no formal training. 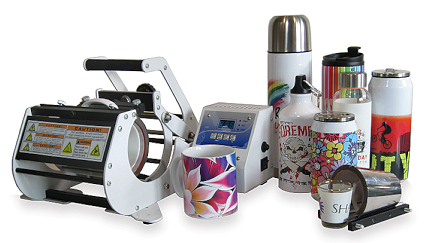 Whether you're a major industrial user or simply looking for an enjoyable and simple way to augment your income, Europa heat transfer presses are the best possible way to apply heat transfers and sublimation prints to a huge range of products.